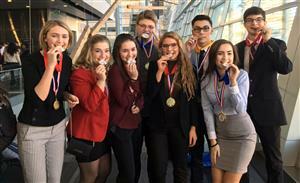 Students from Deca competed at the area competition in Tacoma. Many wolves placed and will advance to State in March. Congratulations to Alex Agee, Trystin Peterson, and Rachel Albertson for taking home first place in their categories. Also congratulations to Ainsley Agee, Avery Meyers, Eva Knowels and Emmy Shaffer for placing 2nd. And also congratulations to Carson West for coming in 4th place. Students are entering a highly competitive workforce based on a global knowledge and information economy. To be career and college ready, students need to be able to integrate and apply 21st century skills, technical knowledge and skills, and core academic knowledge. With an emphasis on real world, real life skills, Career and Technical Education will help students be successful in the future. Our goal is that every student will graduate from high school globally competitive for work and post secondary education and prepared for life in the 21st century. No matter what their dreams, students can pursue it through CTE. The case is this: in order for students to succeed, we need to prepare them for the ever-changing world of work, which means not only college readiness, but career readiness—students with access to post secondary education and skills attainment possibilities that will prepare them to achieve in the 21st century. We ask the question, “Why Career and Technical Education?” with honesty. Why, among the many competing education demands, student needs, and graduation requirements, does a program that has its foundations in the 1917 Smith-Hughes Act hold relevancy still? Between emphases on early learning to college preparation, where does Career and Technical Education (CTE) fit in and merit consideration? Why should students who barely have an opportunity to explore the arts, health and fitness, or social studies, be directed to courses in aerospace manufacturing, horticulture, financial math, sports medicine, or integrated science, technology, engineering, and mathematics ( STEM). CTE needs to be an integral part of every student’s education so that all students graduate from high school globally competitive for work, prepared for post secondary education, and ready for life as positive, contributing members of society in the 21st century. With CTE, students succeed. Imagine not knowing where your next meal is going to come from. Then imagine where you are going to get your next drink of water. That is what life is like for the Pokot tribe in NW Kenya. As Pastoralists living in a mostly arid climate, the Pokot tribe must concentrate almost their entire energies towards successfully finding the most basic of needs-food and water. Heavily impacted by global warming, the Pokot tribe had to endure almost 11 months without a drop of rain. All streams and springs dry up during these droughts. There is a famine belt across Northern Kenya, Southern Ethiopia and Southern Somalia extending across the Red Sea to Yemen that has inflicted great suffering and extensive loss of lives onto many desert peoples. The Pokot people lost 80-90% of their animals, including almost all their cattle. People too are dying, particularly the young, the old and the infirm. People are attempting to survive by boiling poisonous berries for 24 hours in order to get any nutrition at all. Government food assistance is meager or non-existent. However, significant nutritional help is being provided by the Port Orchard Rotary Club(PORC). Partnered with a young NGO called Hifadhi Africa and through District 5020 Community Grants(DCG’s) and Rotary Global Grants(GG’s), life sustaining assistance has been provided during the past year. From Oct 2017-May 2018, 2 DCG’s were used to procure maize which is the primary food consumed by humans. In May 2018, a DCG was executed in just 19 days from start to finish and successfully delivered 48,000 pounds of maize to thousands of people. A highway construction company provided a 20 ton dump truck and with 12 volunteers delivered the maize in 3 days. Because of the rough or non-existent roads in East Pokot, all 12 volunteers squeezed into a truck cab and sleeper designed for 3 people. This maize was directly responsible for saving many lives. Additionally, the PORC was able to obtain monetary donations from Rotarians and friends of Rotarians to procure goats so the Pokot people could start replenishing their herds. Lastly, through a Rotary International GG, a sand dam was constructed which it is hoped will introduce the Pokot people to a different way of life, mainly crop agriculture, and this change in life-style will lessen the hardships presently being endured. A sand dam works on the principal of creating a large sponge around a normally dry stream and this sponge stores water for irrigation, people and animals. It is a basic concept that has existed since biblical times. A future GG will install 3 more sand dams and it is projected that more and more people will adopt crop agriculture as a new way of sustaining themselves. 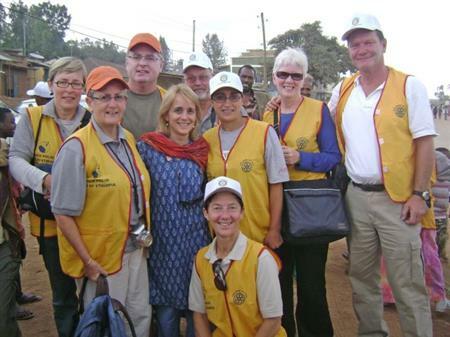 Rotary Grants and the Rotary Foundation is doing wondrous work in an area of the world that desperately needs help.